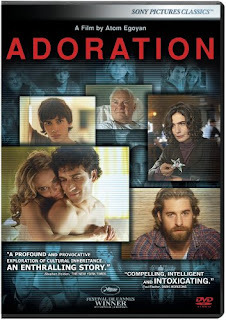 Adoration, out now on DVD and BluRay, begins with Simon (Devon Bostick) telling his French class a story about his parents. His father (Noam Jenkins) was a terrorist who planned to use his mother (Rachel Blanchard), pregnant with Simon at the time, as an unwitting suicide bomber. This is a lie, as we soon learn, but why is Simon telling it? And what is the real story of how Simon’s parents died, leaving him in the care of his uncle (Scott Speeman), and why does his French teacher (Arsinée Khanjian) have such an interest in him? Like most of writer/director Atom Egoyan’s films, Adoration follows an emotional rather than a linear path to reach these answers. There are many surprises along the way, but this isn’t the sort of movie that’s only about the big twist at the end. If anything, Egoyan tries to deal with too many ideas here. A subplot about how Simon’s story goes viral on the internet, while not exactly out of place, almost feels like it could have been a whole other movie. The main story, about how the characters all need to make sense of and make peace with the past, is compelling enough on its own. The themes and storytelling devices in Adoration should be familiar to anyone who has seen Egoyan’s previous films like Exotica or The Sweet Hereafter. Like those films, this is a gripping, intelligent drama that keeps you guessing. That said, it doesn’t quite have the same emotional resonance. Still, even lesser Egoyan is more interesting than 90% of the movies that get released these days. 3 ½ out of 4 stars. I haven't seen an Egoyan film since Sweet Hereafter and Exotica. Don't know how he fell off my radar, but I definitely want to get re-acquainted. His best movie since 'Sweet Hereafter' is 'Ararat', in my opinion. He also made 'Felicia's Journey' and 'Where the Truth Lies', but neither of those blew me away. Still, all have their interesting moments and are worth checking out. I've kind of fallen away from keeping up with Egoyan - why that is, I'm not sure. Ironically, I just happened to rewatch the episode of Friday the 13th: The Series he directed - "Cupid's Quiver." This new film sounds decent - hopefully I'll not let it pass me by!